With summer now behind us, we can look forward to the beautiful Autumn days that we are lucky to have here in Wagga Wagga. The festival attracts well over 7,000 people to the event allowing the Wagga region to showcase some of our premier Wine, Cider and local producers in an event that never fails to deliver. Whilst we are fully booked for this event this year, it is well worth giving us a call to lock in an apartment for next year! It is just a short 5 minute walk from Globe to the Food and Wine Festival. 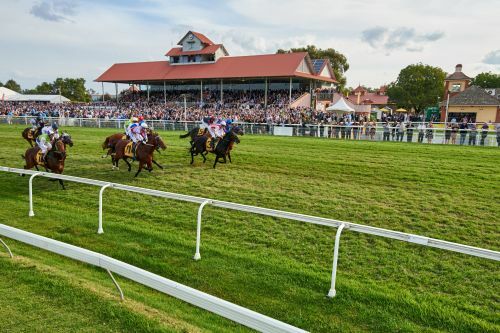 Wagga Gold Cup, the race that stops the region is on again and is by far the biggest day in Wagga Wagga. The Wagga Gold Cup kicks off on the 3rd of May with the Town Plate, followed by the biggest day of all on Friday the 4th, the Wagga Gold Cup. Both held at the Murrumbidgee Turf Club, which is looking very good and will be in fine order come May. The Gold Cup Carnival is a prestigious horse racing event, attracting a top field of horses, along with a ‘fashions on the field’ competition. It is a must see event!! The important news is… We still have accommodation available for this year! We have had one guest booking out all four apartments for years and years but due to unforeseen circumstances, they can not make it down. As such, if you are still looking for great accommodation for you and your friends, give us a call! Our apartments would make an excellent base for the Gold Cup carnival and you, together with your group can book out all four apartments to make it the perfect home away from home.